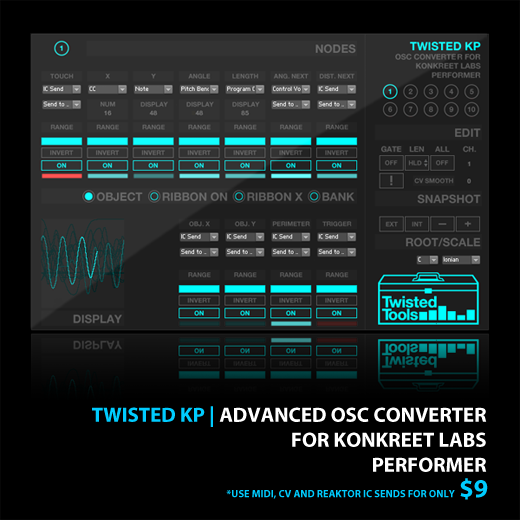 Twisted KP is a dedicated OSC converter for Konkreet Labs Performer application for the iPad. It allows you to easily connect Performer to a variety of devices, both inside and outside of your computer. Twisted KP converts performer messages to MIDI, *Control Voltage and Reaktor IC Sends, in any combination. Simply put, Twisted KP is the bridge between Konkreet Labs Performer and your music software and hardware, allowing you to quickly control almost anything, anywhere. Requires REAKTOR 5.8+ and does not work with Reaktor Player. iPad and Performer app sold separately. 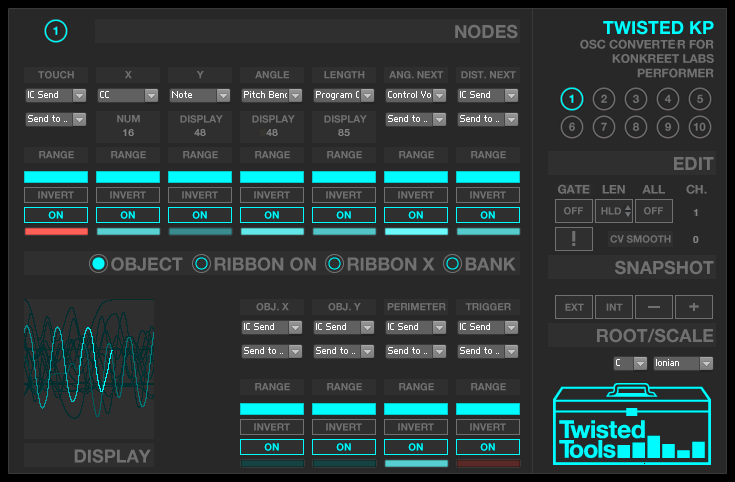 1) Konkreet Labs Performer sends OSC messages to Twisted KP, which runs in Native Instruments' Reaktor standalone mode. 2) Twisted KP receives the messages and provides an easy-to-use interface to convert them to MIDI, analogue control voltage or internal Reaktor messages, called IC sends. 3) You can then route MIDI anywhere out of Reaktor using its virtual MIDI out port, send control voltage out a dc-coupled audio interface to analogue modular synths and/or use an IC SEND menu to instantly select a Reaktor parameter as a destination, via a simple drop down menu. Converts Performer messages to MIDI, *Control Voltage or Reaktor IC Sends. Fast, intuitive and powerful interface. Use Konkreet Labs Perfomer with your host MIDI automation. Presets for NI Maschine MK1, Kore, Moog Voyager, Access Virus and more. Demo versions and presets for Twisted Tools devices. Musical scales to play KP in key and create chord clusters. Bypass entire nodes and/or individual messages. 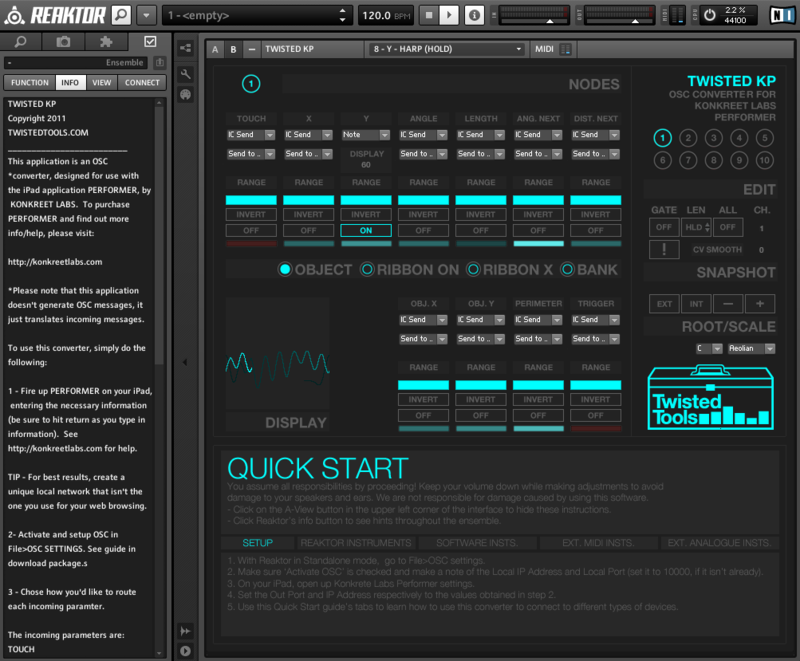 Quick Start setup guide within Reaktor. Reaktor Player is NOT supported. *Control Voltage requires a dc-coupled audio interface. Consult your interface manufacturer's guide to find out if it supports sending control voltage using its outputs before attempting use. The package size for this download approx. 108MB zipped, so please allow yourself ample time to download the file if you are on a slow internet connection. On a fast connection, you should be able to download the package in about 2-4 minutes, while on a slower connection it may take up to an 30 minutes or so. If you have any issues, please feel free to contact us 24/7 for help. Please consider using Firefox and the free download extension, Down Them All, if you are having problems with your downloads timing out. Get it at the Down Them All website. Made something using Twisted KP? Leave us something using our dropbox and vist our community area where we display your work and have competitions!.